Ensuring that ethical principles and human rights are safeguarded during the development and deployment of novel technologies is a core component of responsible research and innovation (RRI). 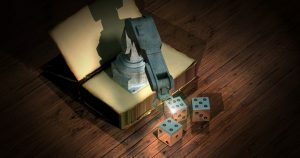 Smart Information Systems have currently reached a level of development that brings a variety of benefits to society, but at the same time they have the potential to disrupt society, ethical values and human rights, and life as we know it. Examples of such technologies include Google’s search engine and translation tools, AI algorithms used in Facebook and other social media, Amazon’s Alexa home assistant, healthcare and surgery robots, personal fitness applications, virtual and augmented reality. 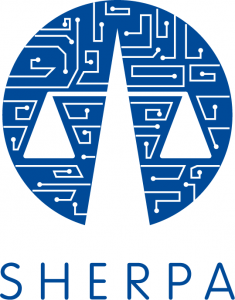 SHERPA aims to identify and address the ethical dimensions of IT technologies by working with a broad range of stakeholders to clarify and represent ethical, human rights and security issues of smart information systems. The project collects existing and develops novel ways of responsibly addressing, evaluating and prioritising these issues and communicating and advocating those solutions that are most socially acceptable, desirable and sustainable. Trilateral Research’s work aims to clarify and exemplify the ethical and human rights issues of Smart Information Systems. This involves developing case studies of current technologies and applications, future-looking scenarios and spelling out ethical and social tensions. In this context, we place a special focus on the current human rights framework and how cyberthreats and technical solutions may have an impact on it. Trilateral is also leading a Delphi study and efforts to explore regulatory options (including the terms of reference for a new European regulator for smart information systems). Trilateral is also responsible for developing and implementing the project’s strategic dissemination, communication, exploitation and advocacy plan to raise awareness of SHERPA, its activities, findings and recommendations and increase the impact of the project exploitation activities. SHERPA is developing a workbook on responsible development of Smart Information Systems (SIS) as an open access living document, containing current suggestions and approaches, proposing novel and additional approaches, notably guidelines for research and innovation in this field. SHERPA is organising workshops for engaging with stakeholders and discussing different scenarios in which emerging smart information systems are likely to be implemented and socially relevant in the near future. Each scenario will explore the key factors affecting ethical, legal, social and economic aspects of everyday life in 2025. They will describe how technology drivers can be organised, evaluated and prioritised to identify indicators that can provide early warning about how they will develop and inform policy. For more information on the scenario workshops click here. the EU. The project aims at ensuring a better design, development and use of novel technologies while making sure these that Smart Information Systems are acceptable, desirable and sustainable. Improving the public knowledge base and understanding of Smart Information Systems ethical and human rights challenges. Positively informing and influencing Smart Information Systems debates and practices through the development of guidelines and standardisation activities. Supporting high ethics standards and promotion of RRI as a fundamental principle of Research and & Innovation in the EU. Reconciling the SIS needs and values of society with the needs of scientists and innovators by considering them in the design of outputs and fostering dialogue with them. Supporting the innovative nature of research and maximising the positive socio-economic potential of Smart Information Systems by presenting solutions that are stakeholder-informed. 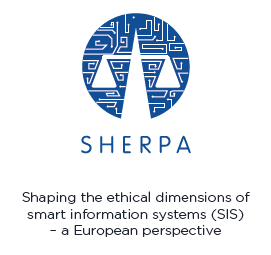 The SHERPA project, Shaping the ethical dimensions of smart information systems (SIS) – a European perspective, is an EU funded project under the European Union’s H2020 research and innovation programme, grant agreement No. 786641.